Mars is moving into Libra and will stay there until December 9th. 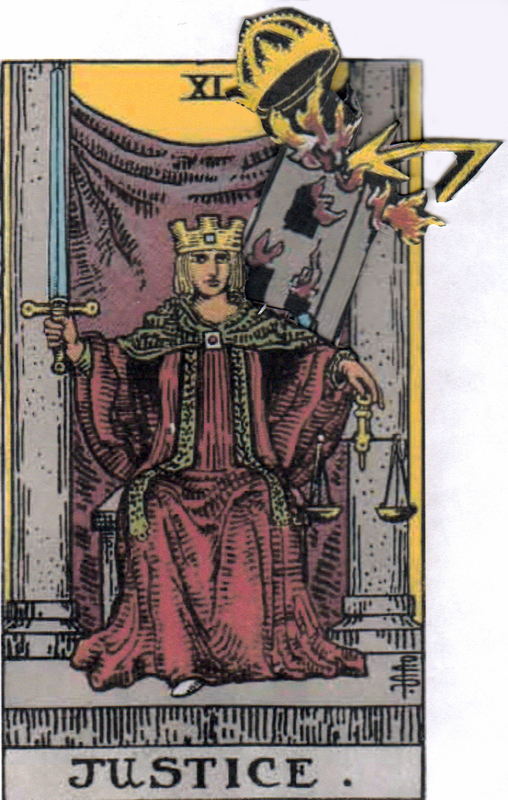 From a Tarot perspective, this transit is like the Tower’s lightening is striking the seat of Justice. Balance is being mightily realigned. With Mars in Libra, or the Tower’s lightening striking Justice’s throne, definitions of what’s right or wrong become less clear. Mental paradigms begin to shift. During this time, take advantage of any unexpected changes in your life to look at things from a new perspective. Old connections, patterns, and methods of decision-making might be open for review. Don’t be afraid to shake things up. Out of the chaos, a new balance will emerge. It might not be what you expected, but it will be just right. Mars is moving into Virgo and will stay there until October 22nd. 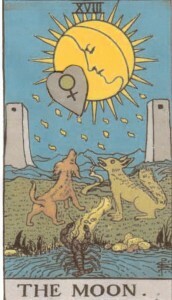 From a Tarot perspective, this transit is like the Tower’s crashing around the Hermit and the night skies are on fire. 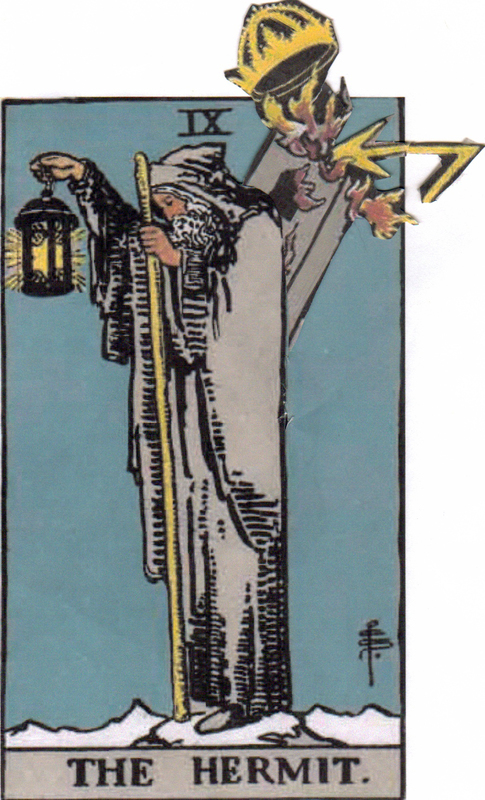 Mars in Virgo, or the Tower striking the Hermit, is a time to throw away your old routine and start building a new one. A new perspective is almost certain to arise, and it’s likely to come from somewhere unexpected. Don’t be afraid to look beyond your comfort zone, and don’t give up the details just because things around you seem chaotic. It’s time to energetically reorganize and create a new plan of action that will be even better than before. Stick with what you need to do and keep going. Things will calm down soon enough, and you’ll know so much more by the time it’s done. 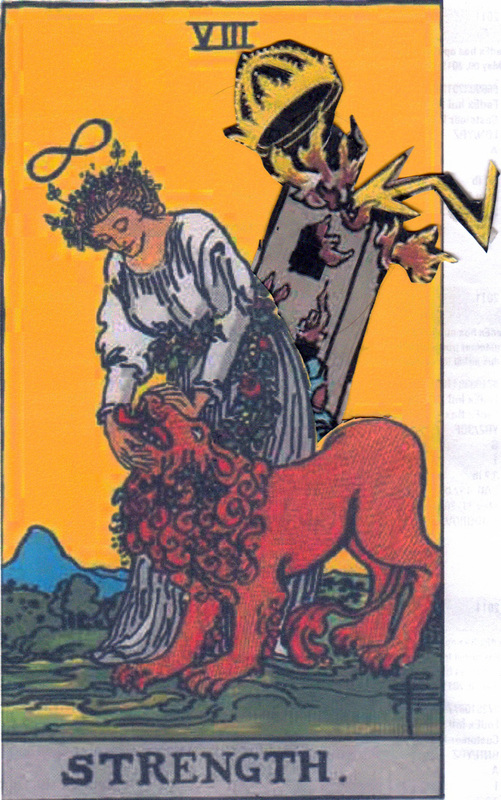 Mars moves into Leo today and will be there until September 5th. 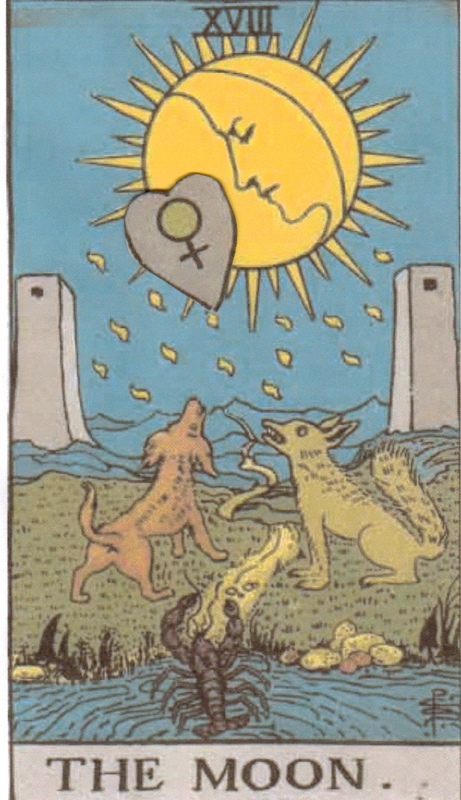 Looking at this transit from a Tarot perspective, it would be like the Tower is tumbling around Strength and her lion. 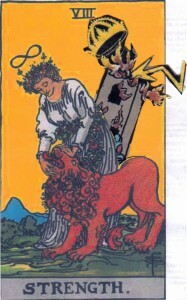 Mars in Leo, or the Tower falling around the Strength’s feet can be a time chaos contained. Tempers might flare as unexpected situations arise, but you have the power to deal with pretty well anything that comes up. Just believe it and keep going. See if you can harness the high energy to really make a difference, positively shaking up your life to get it more in line with your spirit. Don’t fear change, embrace it and see how strong you really are. Mars moves into Cancer today and will stay there until July 20th. From a Tarot perspective, it would be like the Tower is taking a ride on the Chariot. Lightening might strike, but the Charioteer just keeps moving forward. Mars in Cancer, or the Tower taking a ride on the Chariot can be a period of powerful change, it’s movement that can seriously alter your direction. Travel might be less predictable than usual, and it’s likely that unexpected circumstances will get you rethinking plans in general. Don’t be afraid to change course if suddenly your first path is blocked. There’s a great deal of energy available now. Use the push to get things really happening. Stay armoured, but keep moving. It could be an exciting time. Mars has moved into Gemini and will be there until June 4th. 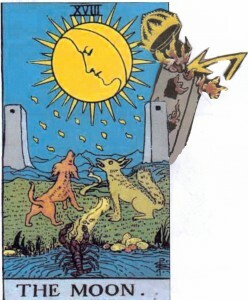 Looking at this transit from a Tarot perspective, it’s like the Tower’s struck the Lovers’ Angel. The heavens are shaking. Are the Lovers about to go for a tumble? Mars in Gemini, or the Tower striking the Lovers’ Angel, can be a time of disruption in relationships, and mental attitudes. Commitments you thought were sturdy, might suddenly not seem so solid. But paradise lost could actually mean freedom from choices that no longer satisfy. New information and circumstances can ultimately lead to expansion of the mind and a deepening of commitment. A new solidity can be established, but the foundation is likely to shift. Look at this period as a challenge to be as open-minded as you can. Ideas will likely be flying fast and furious. Options you hadn’t considered might soon seem quite reasonable. Go with the flow. Liberation and illumination are possible. Not despite the chaos, but because of it. Mars moves into Taurus tomorrow and stays there until April 21st. 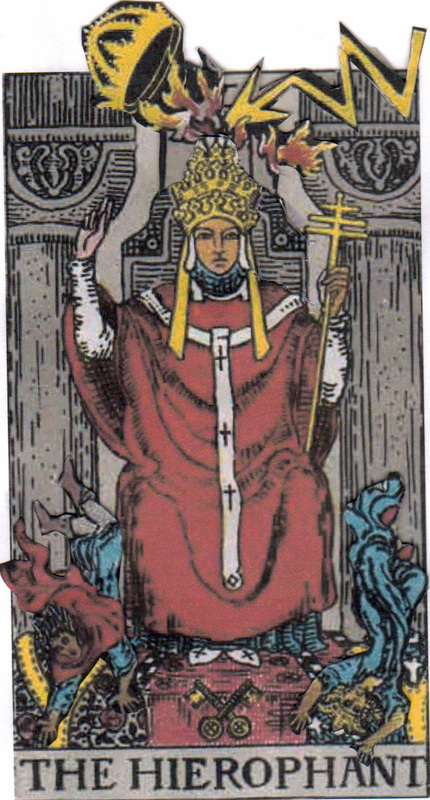 Looking at this transit through the eyes of the Tarot, it’s like the Tower’s lightening has struck the Hierophant’s throne. And his acolytes are tumbling down. 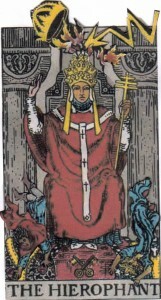 When Mars moves into Taurus, and the Hierophant’s stone throne is struck by lightening, we might find that what we thought was certain, no longer seems so obvious. Belief structures might shift, and rules that used to make sense might now feel outmoded. Old ways of seeing the spirit, religion or traditional structures are all up for review. As could be our perceptions about who really has moral authority. Don’t be afraid of letting tradition for tradition’s sake fall away. And if an idol or two falls with it, that’s all right too. It might be a bit chaotic for a moment, but this is your chance to find faith in yourself. Use it as an opportunity to start being your own last word. Mars moves into Aries tonight and stays there until March 10th. 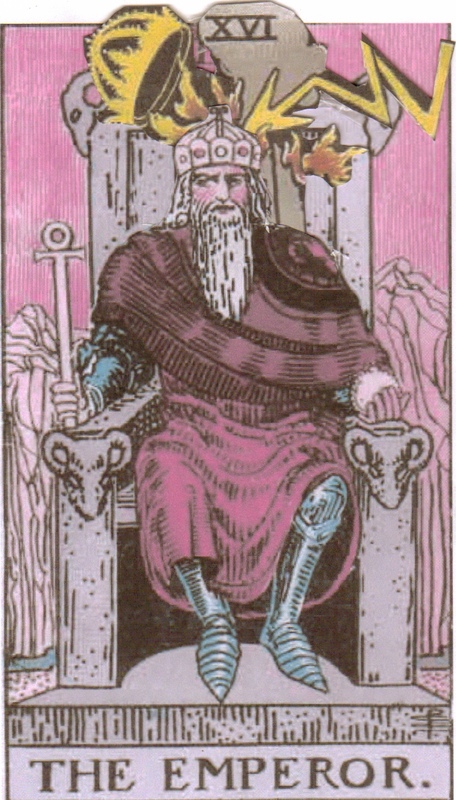 Looking at this transit from a tarot perspective, it’s like the Emperor was sitting in his castle just as the lightening struck. His stone throne is exploding. 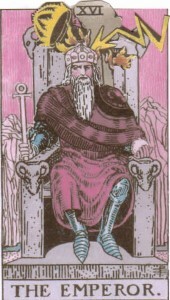 Mars in Aries, or the Tower as the Emperor’s throne, is likely to be an exciting time. What you thought would never change suddenly does. It could just be a way of seeing things. Old ideas are shattered and inspiration to begin afresh becomes overwhelming. Or things might really be changing. New circumstances present themselves without warning and the way you were approaching a situation no longer works. Destroy inertia and create a new world for yourself. This is a time of great power. Potentially challenging, yes. But also a chance to take charge in your life like you never thought possible. Venus moved into Pisces today and stays there until February 3rd. 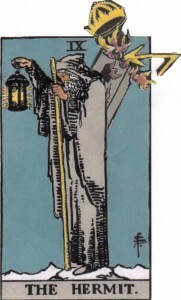 If you look at this transit from a Tarot perspective, it’s like the Empress is dressed as the Moon. She’s all but disappeared in the night. 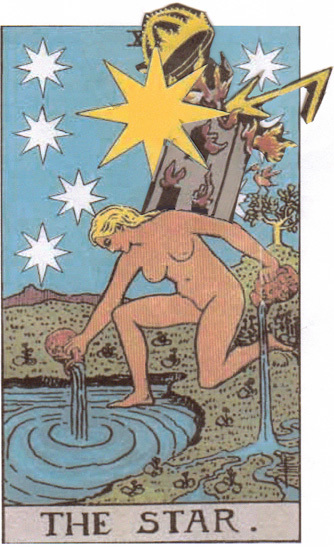 Venus in Pisces, or the Empress dressed as the Moon, is a good time to embrace your own unconscious depths. Nurture your psychic energies through art, poetry or creative visualizations. And try not to be afraid. Feelings that are usually expressed out loud might be less open than usual. That doesn’t mean they’re any less deep. There’s as much beauty in the dark as there is in the light. It’s just not flashy. Dive into the mysteries and enjoy what you can never know for sure. Mars moves into Pisces today and will stay there until January 28th. Mars moves into Aquarius today and will stay there until December 19th. 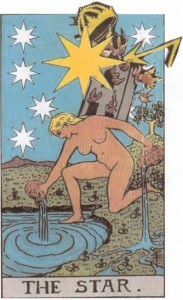 You are currently browsing the Tarot Mars Transits category at The Tarot Room.